Basically there are 2 types of pool decks, concrete and paver. Maintenance for both is essential to ensure they continue to look good. Concrete Decks are susceptible to cracks as the earth below moves; these cracks can be filled and then painted over. General maintenance such as pressure washing should be carried out on a regular basis, particularly when a deck has poor drainage. Concrete decks should be repainted are filling in cracks or when deck shows signs of wear and tear. 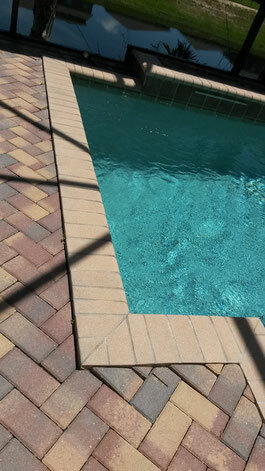 Problems with paver decks occur when ground movement occurs causing the pavers to sink. Uneven pavers become trip hazards and should be rectified as soon as possible. 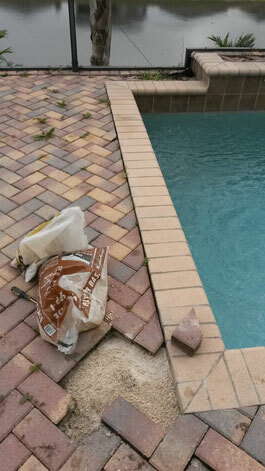 This involves lifting pavers, repacking the sand underneath and then relay pavers. Unfortunately, particularly on new decks, this may occur more than once as the building continues to settle. One other issue with pavers is that debris and moss can collect in the seams a lot of which could eventually end up in the pool. Pressure washing removes this but will also take out a lot of the sand used to hold the pavers in place. One way to avoid this problem is to have the pavers pressure washed, new jointing sand added and then have the whole deck sealed with a special clear sealant.